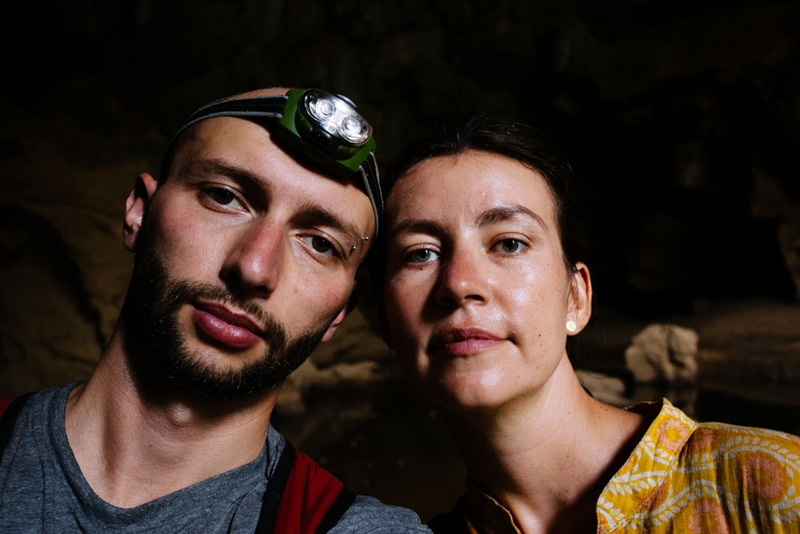 So – if you’ve read out account of Day 1 and Day 2 & 3 of Thakhek Loop, you know that we had an awesome time exploring the caves, riding the scooter, and swimming in the Lagoon. Even considering the poor road conditions on the few stretches of the Loop, we would wholeheartedly recommend this adventure. So, we’ve put together some thoughts on how to arrange one of your own! There is a lot of information on the internet suggesting that Thakek Travel Lodge is the place to be if you want to do the Loop. It’s true they have Log Books filled out by other travelers, and you can meet other adventure seekers there who are doing the Loop. 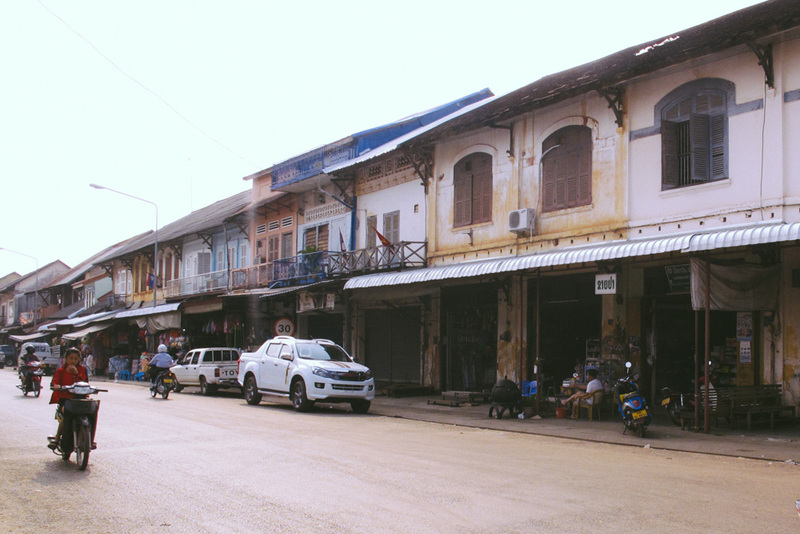 But keep in mind that pretty much the only reason tourists visit Thakhek is to do the Loop – so guests at any other hotel in town are most likely there for the same reason as you. And, any bike shop and most lodging places will provide you with a map of the Loop. 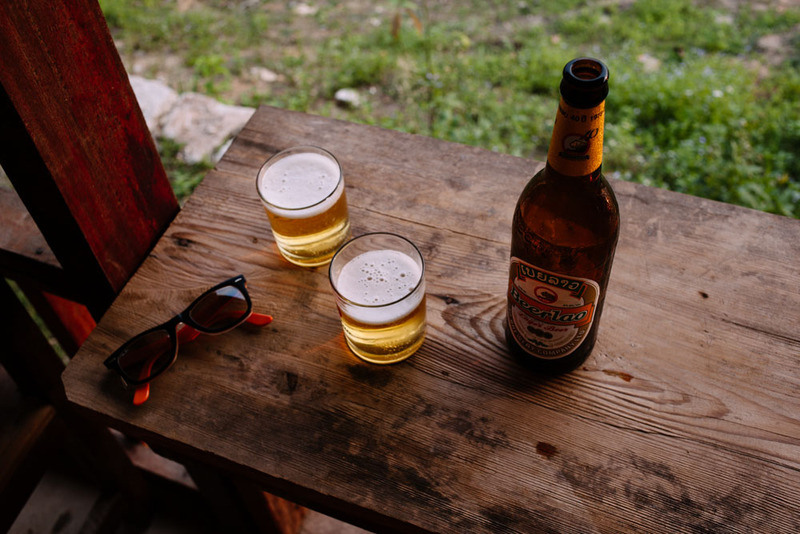 The main reasons we passed on Thakek Travel Lodge were the unfavorable reviews on TripAdvisor and the fact that it was pretty far out of town, meaning that we would have fewer choices for food and bike rental, which almost certainly meant that we would be overpaying. 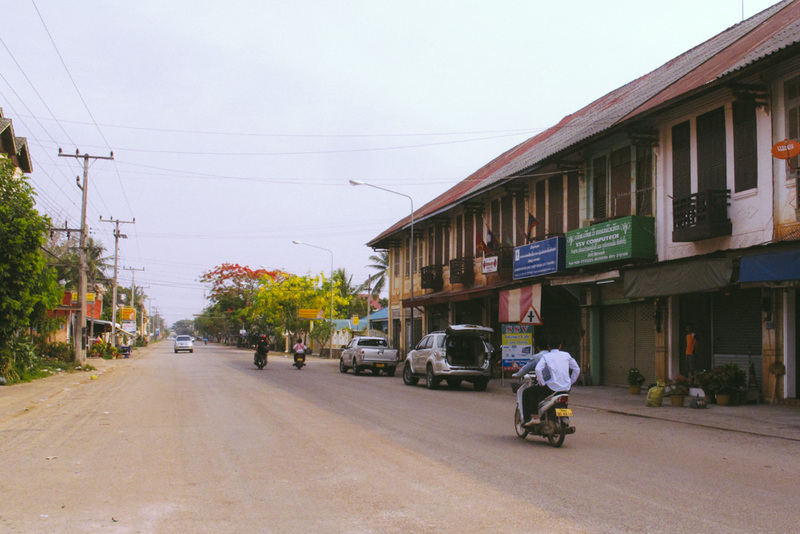 Instead, we stayed right downtown at Inthera Thakhek. After seeing a few uninspiring places around the central area of town, we decided that Inthera was worth the little bit of extra money. Also a big plus of Inthera – it has the best showers – maybe ever. And you will definitely want that shower after doing the Loop. We paid $27 directly to the hotel for one night, and $24 on Agoda for the second night that we spent in Thakhek after completing the Loop. 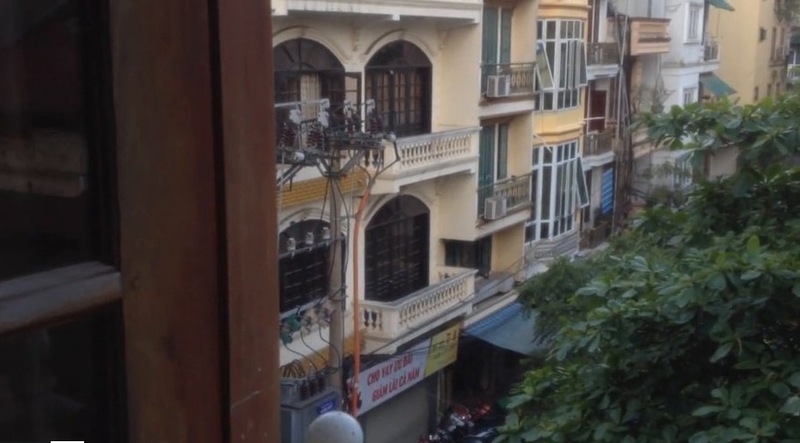 If you are on a tighter budget, check out the Mekong Hotel on the water, also in Central Thakhkek. It looks imposing and even corporate (is that possible in Laos?) and we didn’t actually even walk in there. But! We’ve heard from other travelers fan rooms are only 100,000 LAK., and A/C rooms go for 130,000 LAK. 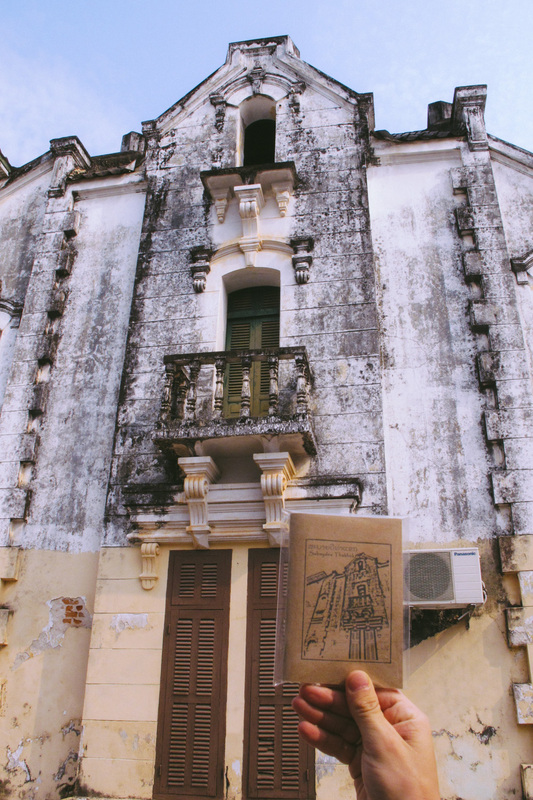 Neat buildings in Thakhek, Laos. Pack light since you’ll be carrying everything on the back of a motorbike – we were able to put one of the daypacks inside the seat of the scooter, but the other one we had to wear. You should bring a flashlight / headlamp and flip flops to explore the caves, which are dark and wet! Keep in mind the season and the fact that parts of the Loop are at higher elevations, so it will be colder than in Thakhek. Headlamps/ flashlights are a must item in your daypack. 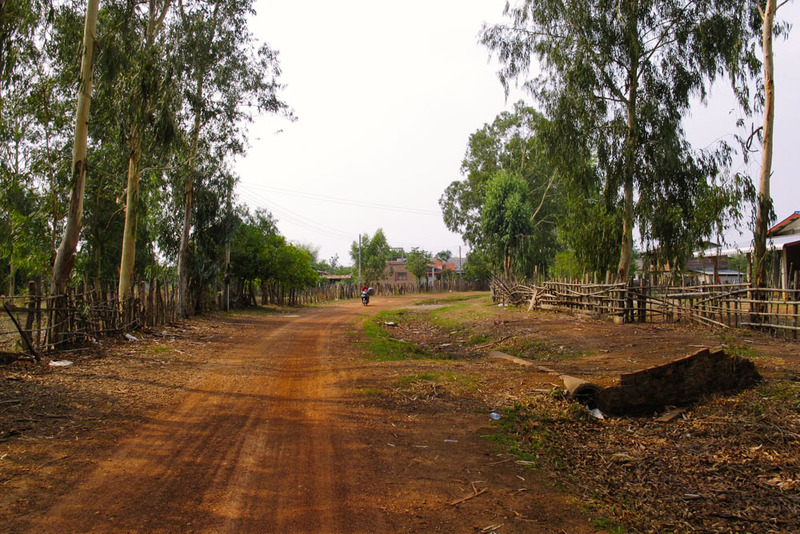 Thakhek Loop, Laos. We left our big bags at Inthera. We had spoken to the hotel staff the night before to arrange the storage and they said it would be no problem. We didn’t quite realize that meant that our bags would be sitting out in the hallway between the check in desk and the kitchen. We have luggage locks for all of our bags, so we weren’t worried about someone getting into the bag. But – someone could have probably just walked off with one of our bags. Everything worked out fine for us, but just keep that fact in mind. We do know that Mr. Wang Wang offers storage, as should any other bike rental shop. Other guesthouses and hotels should be open to storing your things as well. There are a couple of rental shops in Thakhek proper, plus Mr. Ku’s rental operating out of Thakhek Travel Lodge. We rented our bike from Mr Wang Wang, located in downtown Thakek square near the Mekong. It’s diagonally opposite the Inthera Thakek hotel. There are a number of other shops near Mr Wang Wang — two doors down is Mad Monkey, which looked like a professionally run outfit. 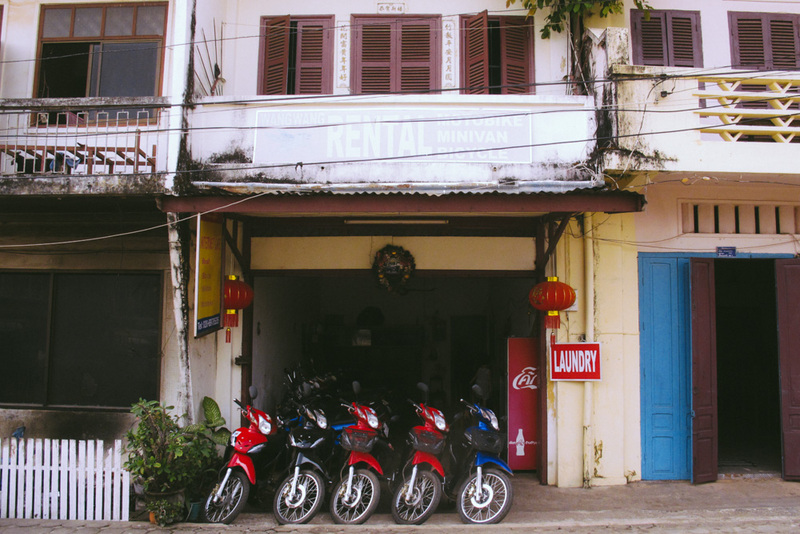 Mr Wang Wang Rental Shopt, Thakhek, Laos. We chose a Chinese made 110cc scooter at the rate of 60,000 LAK per 24-hours, paid upfront for all three days. Two helmets and a map of the Loop came included for the price. For comparison, Mr. Ku charges 100,000 LAK – justifying the higher rate with a promise of paying for any repairs that the bike might need, except for punctured tires. In our experience that’s a bad deal: the tires will be your main concern – and if anything else breaks, the price to fix it, will most likely cost you less than 120,000 LAK that you are overpaying for the scooter rental. Mr Wang Wang – like all other shops – requires a deposit of $500 or your passport. We had no problems getting the passport back. The reason for the steep deposit – apparently there have been lots of cases of travelers abandoning their bikes half way through the trip, leaving the shop owners to clean up their mess. Best time to pick up the bike is in the evening. That’s when most riders return after completing the Loop, which will ensure a wider scooter selection to choose from. Plus the rental is for 24-hours, so as long as you return the bike on the day you roll into town, the timing of your pickup and drop off should dovetail nicely with 24-hour rental timeframe. The biggest plus of this strategy though is that you will have your bike ready to go first thing in the morning, rather than have to deal with choosing the shop to rent from, the type of bike you would like, etc. Be prepared to take a thorough look at the bike – even if you have no idea about scooters, the more carefully you inspect the scooter, and the more (smart) questions you ask / observations you make to the shop owner, the better rapport you will establish. This will help to ensure that you walk out with a properly maintained vehicle that will make it through the Loop no problem. Our 110CC scooter. Day 2, Thakhek Loop, Laos. Do gears shift without funny noises? Does engine sound like a purring kitten or deceased lungs? Do the lights / turn signals work? You absolutely must do a practice ride – get on the bike, ride around the block, shift gears from lowest to highest, and try the emergency stop – meaning, accelerate to 20 km/h and try to do a hard stop. Did you fall? No? Great! Did the bike stop in a reasonable time? Since you are a savvy renter and getting your bike the night before, you should have no trouble testing blinkers and lights! Although it is important to have speedometer, it is not essential. 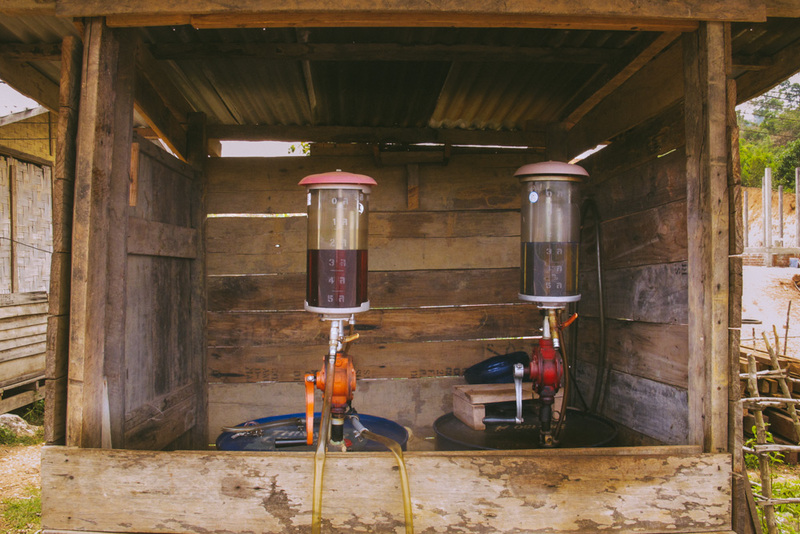 Most important gauge is your gas one. 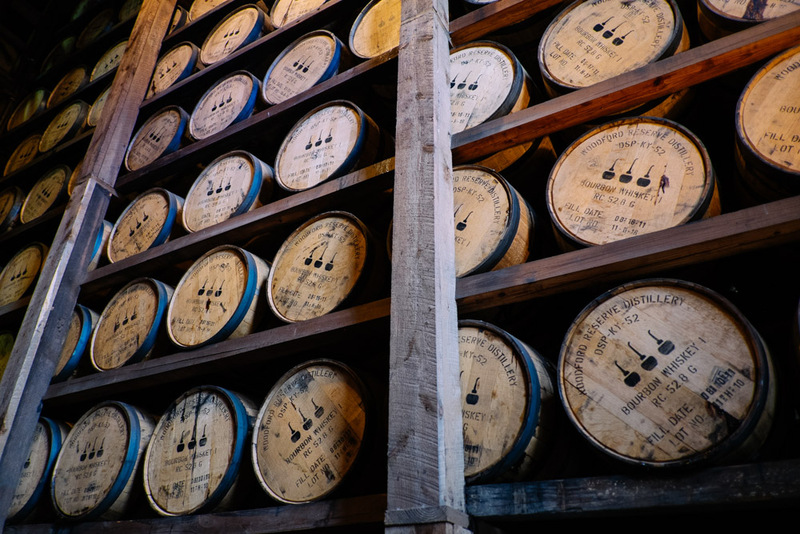 You will find gas along the Loop, but it’s a good sense to refuel once you get to a half tank, and absolutely by the time you hit quarter tank. A full tank wil get you around 150-200km, depending on your riding style. Last and most important part is existing damage. Walk around and voice, loudly, all the concerns you have, and if possible, take photos with your phone and show them to the owner. If you don’t voice it, it is your problem. Full face visor is helpful for all those dusty times – which is often on Thakhek Loop – an alternative is a good pair of sunglasses, but obviously that’s not as much coverage. We never saw another traveler wear these and we completely don’t get it! These masks are lung savers on the roads like Thakhek. 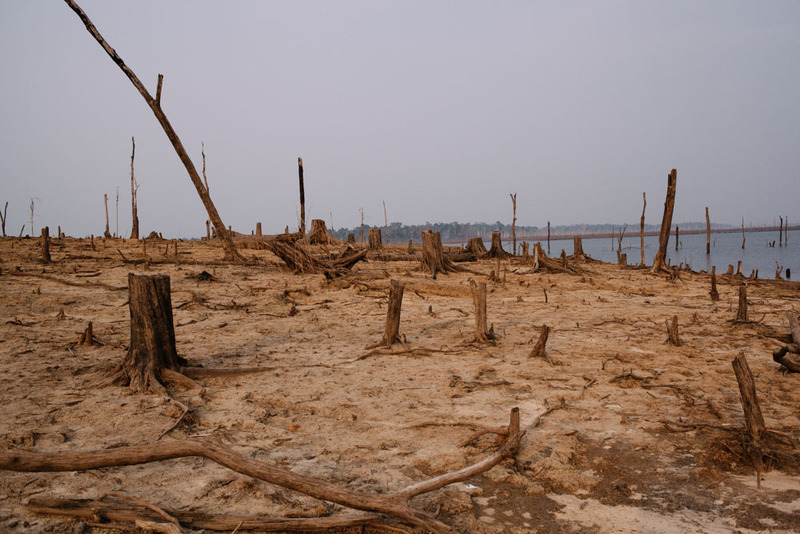 Dust is commonplace, and at times we would pass through stretches of the road where locals practice slash and burn agriculture, which meant a dollop of thick smoke enveloping the road for a good few minutes. These masks were essential to allow us to keep riding. Plus all the patterns and colors are so fun. You can purchase the masks at any local market, or just ask at your hotel, all of the staff have one and will be able to point you in the right direction. 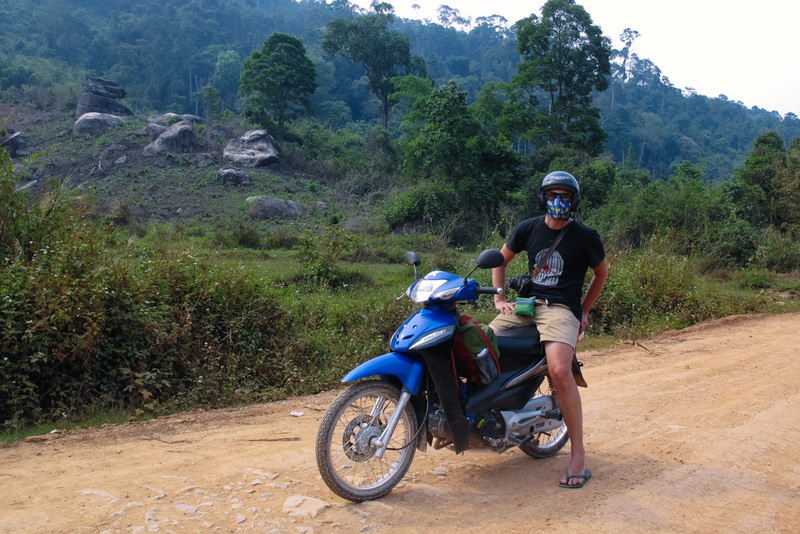 Sergey on the Thakhek Loop, Laos. Highly advisable. 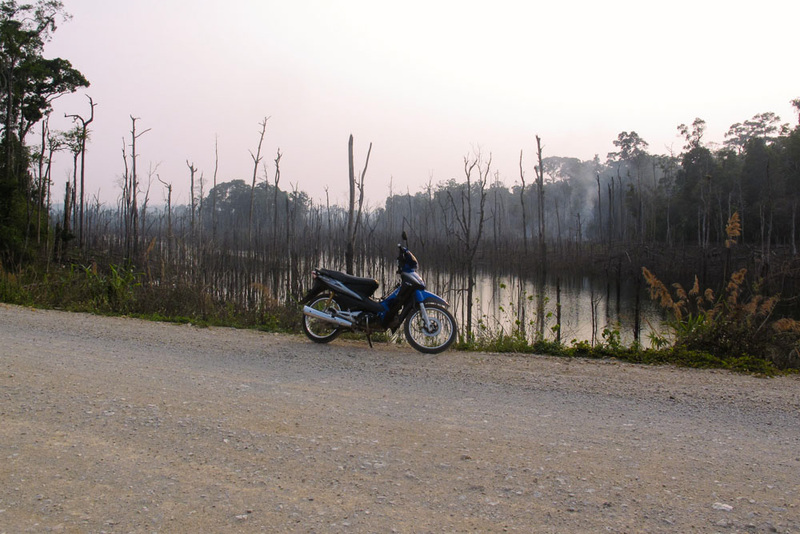 A good stretch of Thakhek Loop is all pebbles, and a good pair of riding gloves will help to mitigate vibration. Long sleeves help not only with a sunburn, but dust as well. Consider a windbreaker if traveling during chillier months or early mornings, riding at 50 km/h can seriously lower the body temperature. And of course, sunglasses; Wind is your enemy and your eyes are precious, protect them. Relaxing at Phosy Guesthouse, Thakhek Loop, Laos. We had a map from Mr Wang Wang and it was as good as any. I took a picture on my phone of another map put together by Sabaidee guesthouse in Tha Lang, which in retrospect didn’t reveal any new information. 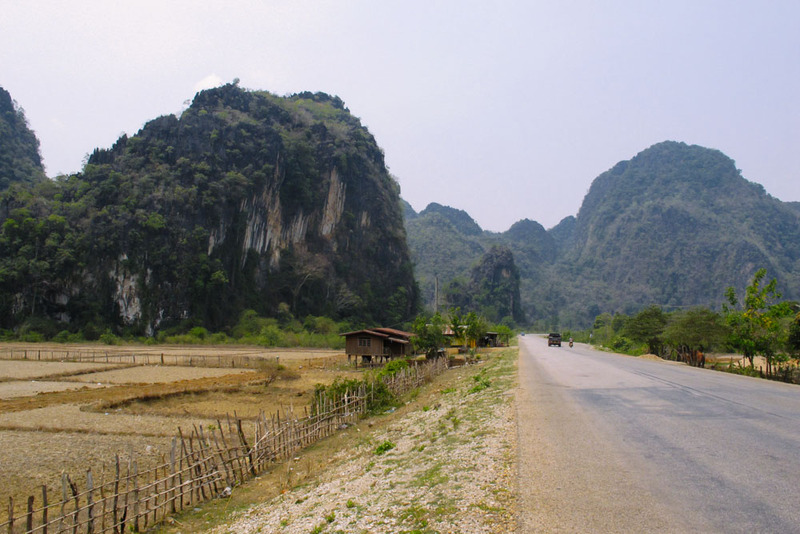 It’s hard to get lost – you are following a circular route, with signposts all the way to Kong Lor Cave, and after that it’s a smooth highway back to town – unless of course you choose to double back and come back the same way. 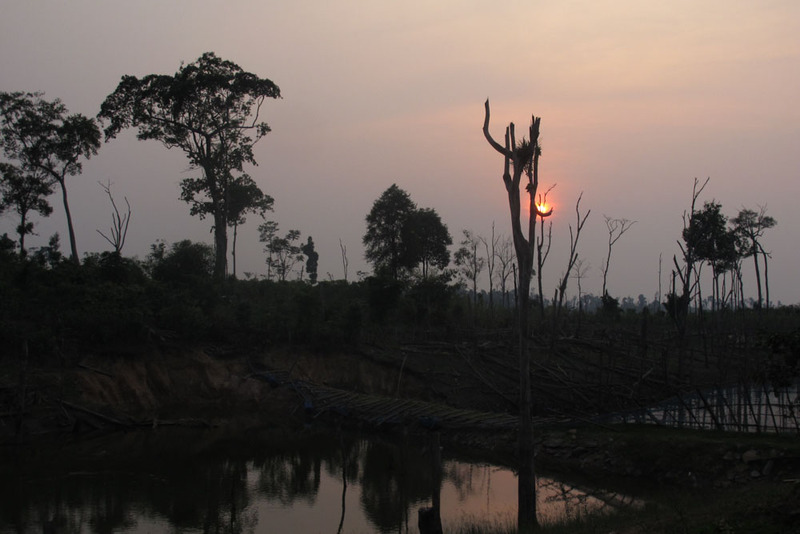 Surreal scenery in Thalang village, on Thakhek Loop, Laos. Also, if you are doing the Loop in counter clockwise direction – you will see signs for caves, scenic viewpoints, and swimming holes pretty much right away on leaving town. 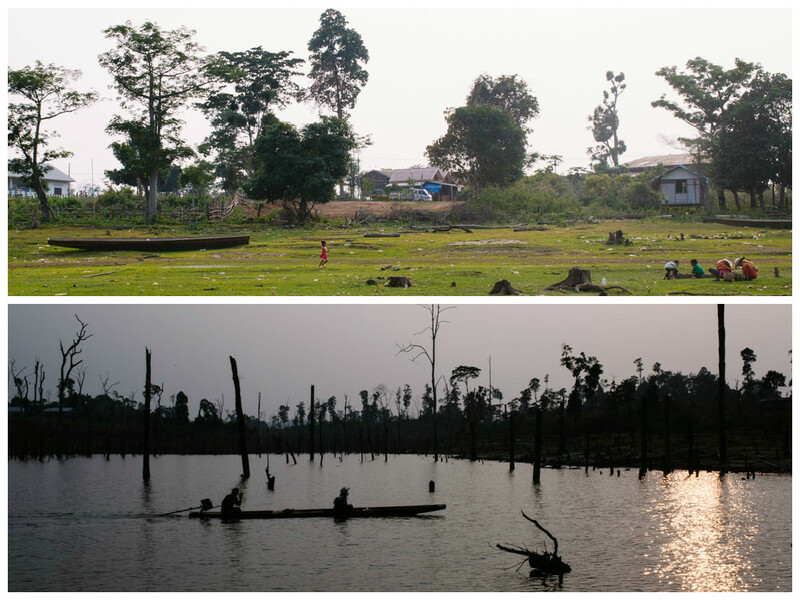 See our two posts for a listing of each stop we made on our 3- day drive of Thakhek Loop. *We went to check out Travel Lodge to see if we could get more information on doing the Loop. However, since we weren’t staying there and weren’t renting bikes from them, the reception declined our request. We weren’t too concerned though, and really the trip turned out just fine without any extra tips from the Travel Lodge. We covered the Loop in 3 days, some people do half Loop in 2 days – from Thakhek to Thalang and back. But then you end up skipping the Kong Lor Cave, which is rightfully considered the highlight of the journey. 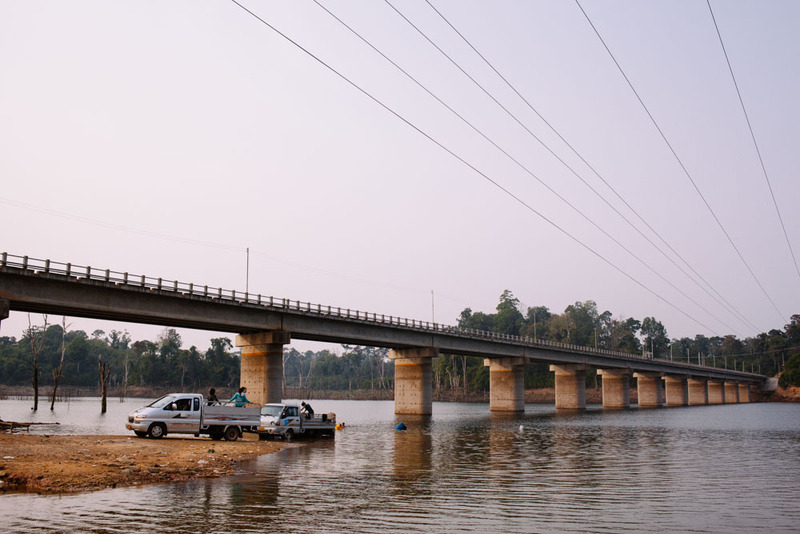 We’ve heard a few people suggest taking 4-5 days to do the Loop, adding a few minor attractions and detours, going up to Kong Lor and then retracing the original journey rather than taking Highway 13 to Thakhek. 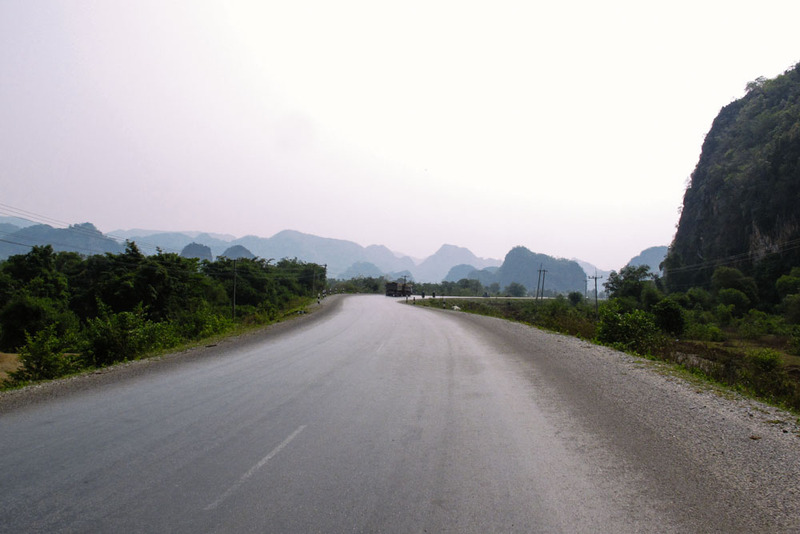 We didn’t think that highway 13 from Kong Lor to Thakhek, was that bad though – it’s smooth, boring, and light on traffic. Overall – we thought 3 days was just about perfect amount of time for the Loop, any longer might have been a tad too long (for us). Expect to ride at the speed of 40-50 kph for about 6-8 hours a day with stops. We covered about 100 km between Thakhek and Thalang on Day 1, 160 km between Thalang and Kong Lor village on Day 2, and 186 km between Kong Lor and Thakhek on Day 3. We also did a detour on Day 3, adding on additional 36 km round trip on a terrible road to the Blue Lagoon – that added several hours to our trip (that’s how ban the road was). Leave earlier rather than later. If you leave around 8:30 in the morning, you should have plenty of time to sightsee, relax over a bowl of lunch Pho, or to fix the bike, should anything go wrong (don’t discount that possibility). We didn’t take any extra fuel with us, and were just fine. That said, we fueled up at every opportunity if the fuel gage showed anything less than half a tank. Stops between gas stations are rather unpredictably spaced. Sometimes you’ll come across a modern looking shop – other times, it will be a DIY entrepreneur. Either way just mind the gas gage, and you should be just fine. 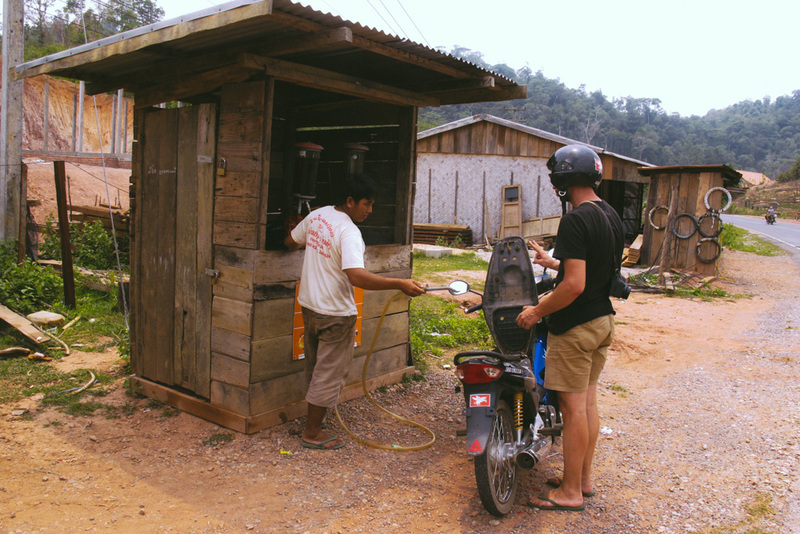 Refueling on Thakhek Loop, Laos. Delicious Pho for lunch for three days straight. Seriously, so good. 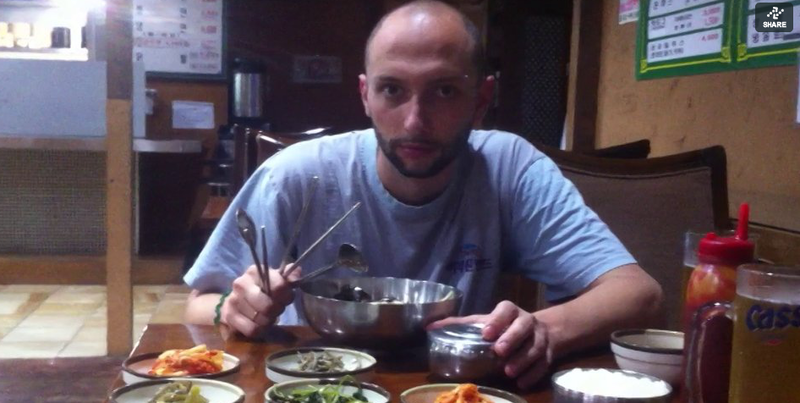 We didn’t have any trouble locating local place for lunch. For breakfast and dinner the guest houses will have restaurants on site. 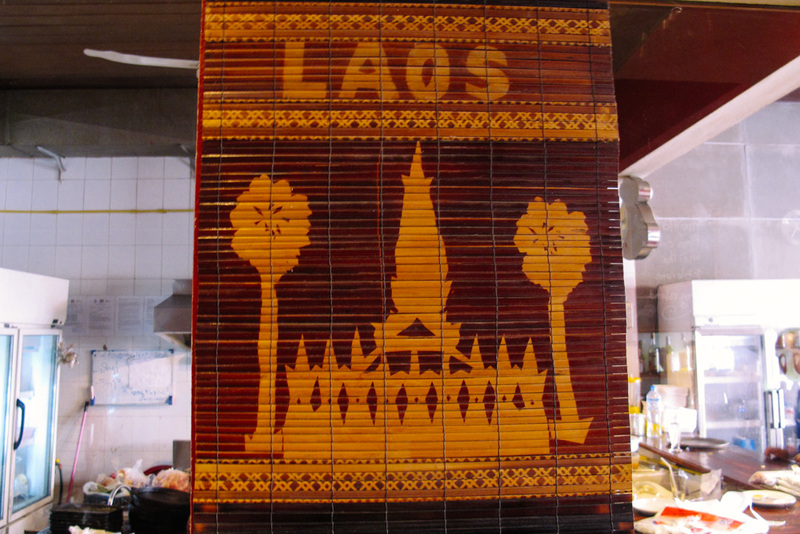 We thought the food at those establishments was subpar, weird Lao versions of Western food – but hey, what are you going to do. Supply and demand dictates its own rules of the game. 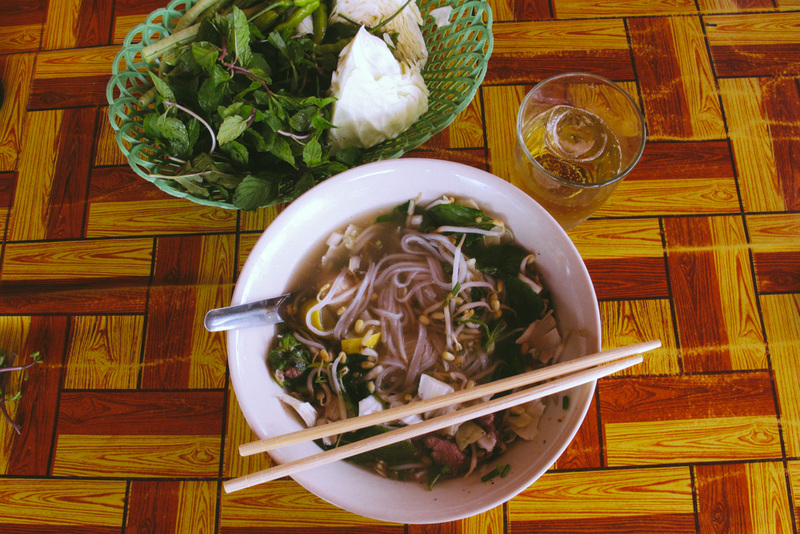 Delicious Pho is what’s for lunch. 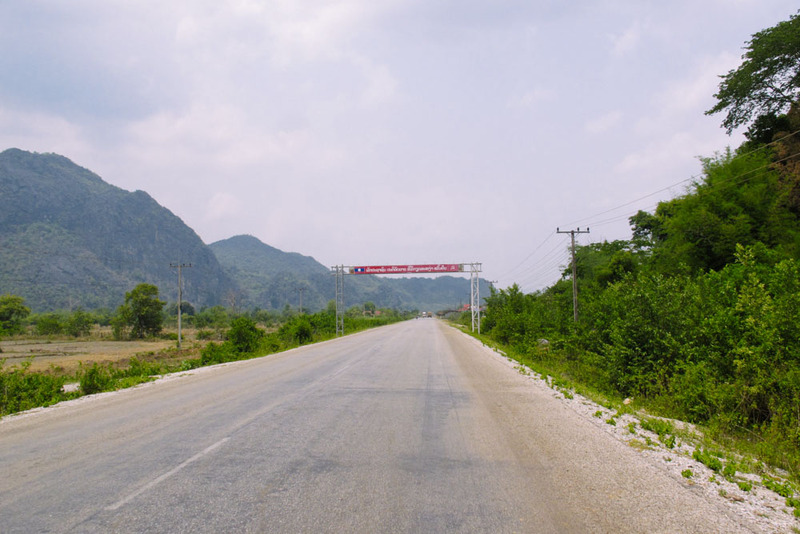 Thakhek Loop, Laos. The maps for the Loop will indicate places to stay. We stayed in Thalang the first night, and in Kong Lor village the second. We provide ratings and thoughts on our dedicated lodging page. Sunset as viewed from Phosy Guesthouse. 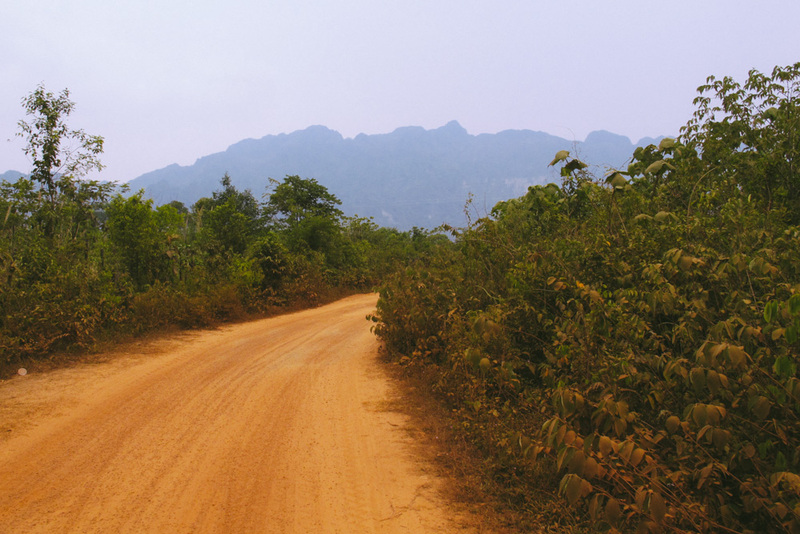 Thakhek Loop, Laos. Bring enough cash in LAK to last you the entire time of the Loop – budget between 50,000-100,000 for lodging, around 100,000-300,000 for food, and 300,000 for all admission fees and gas. No ATMs on this road! 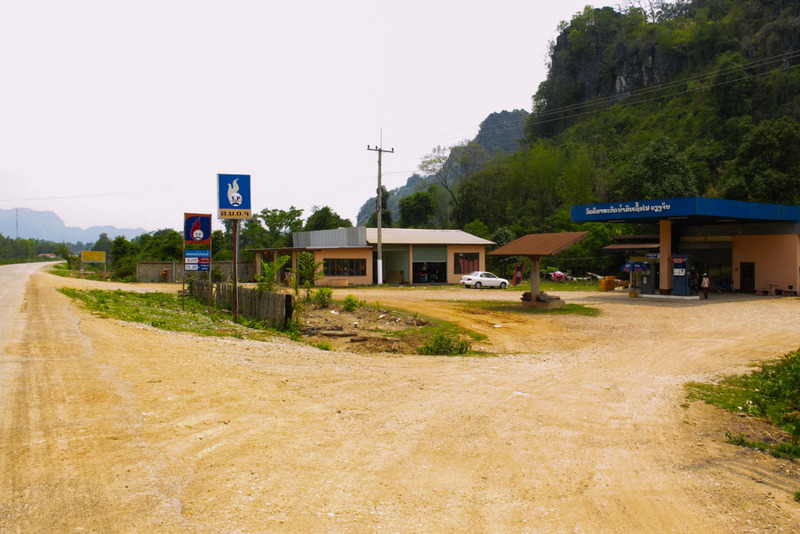 Or anywhere else for that matter on Thakhek Loop, Laos. If you would like to read the account of our adventures on Thakhek Loop, have a look at Thakhek Loop: Day 1 and Thakhek Loop Day 2 & 3. Cheers to happy riding!